Though we've had a wet summer, and the landscape is still overwhelmingly green, the greens are changing as the season progresses. I have two different yellows that I keep on my palette: a lemony sort of yellow, and a cadmium yellow. In the spring the former gets the most use when mixing my greens, but as we move towards autumn, the cadmium becomes the most squeezed tube. I set up yesterday in the slight shadow of a scrubby little box-elder. The dogs were with me, dashing off after every strange sound or smell, and then returning to pant happily in the shade. Fields and pastures are filled with blossoming Queen Anne's Lace, yarrow, asters, clover, and many grasses going to seed. I started out the week exhausted, and I'm afraid I stumbled rather sleepily and late into the welcome breakfast that kicked off the event. :P It was good to see some familiar faces, as well as many new ones this year. This year's judge gave a demo following the breakfast, which was very fun to watch. I didn't stay to the end, though - I wanted to get out and paint! 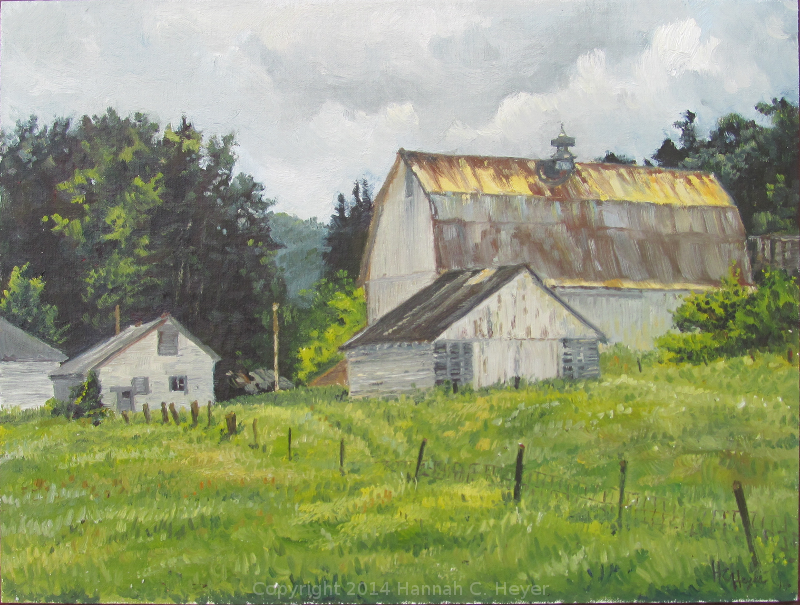 I found this beautiful old farm, and my eye was immediately drawn to the way the light, breaking through the clouds, hit the roof of the barn, and the surrounding long uncut grasses. My kind of sloppy initial sketch. I can be a bit haphazard with my progression on a painting! I wanted to get that roof in before the light changed too much. I took a scenic drive home that day, driving part of the way on the Wisconsin side of the river. 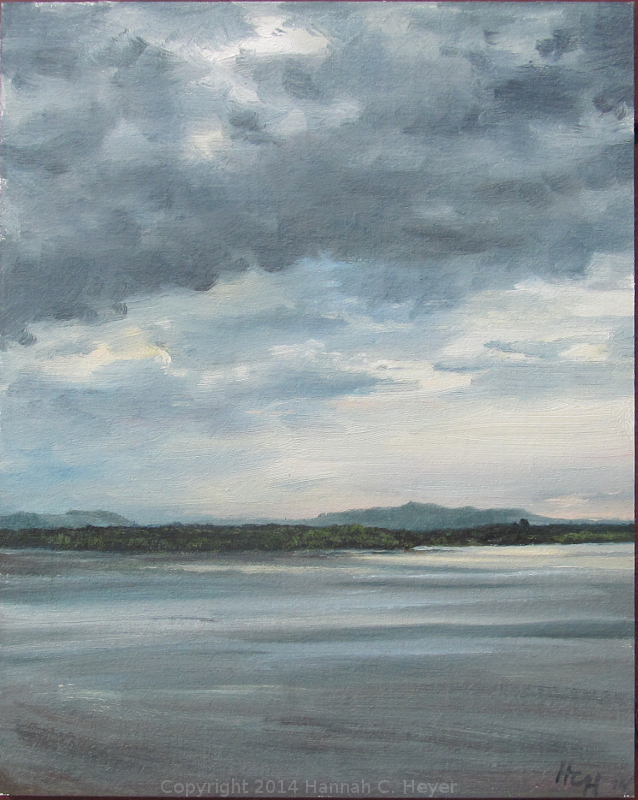 I stopped for awhile at a lookout and painted the quickly changing clouds over the water. I admired the many colors in the river, as the dark clouds and patches of sunlight shifted with the changing weather. I finished as the thunder started and before it started to pour. 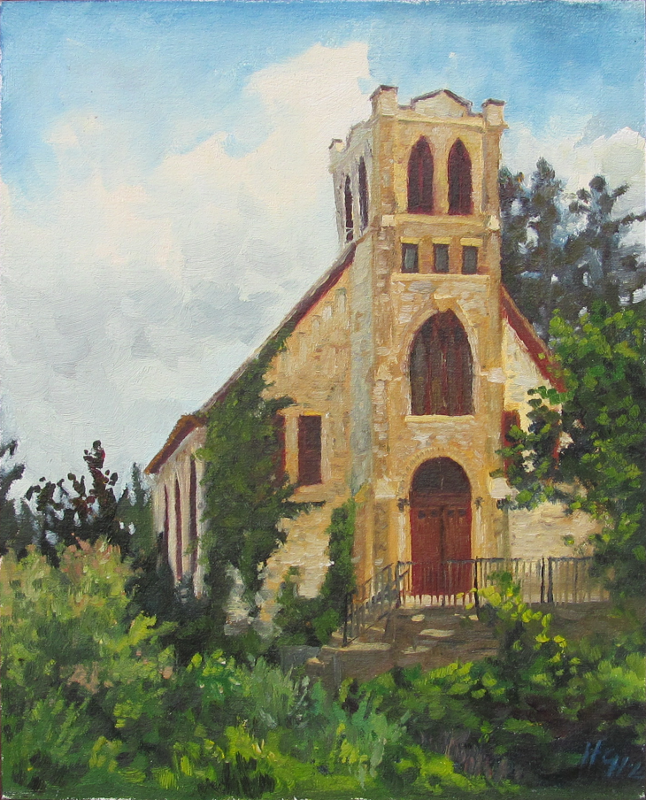 Tuesday was "Paint the Town" day, and I wanted to paint this beautiful old church building (now a house) and gardens. I really picked a bad time of day, though. The light changed so quickly! And even though there was blue sky showing between the clouds, I got rained on twice. Wednesday morning was rainy and gray. Late morning, when it was only cloudy, I hiked up on Barn Bluff and took the prairie trail. It was beautiful. 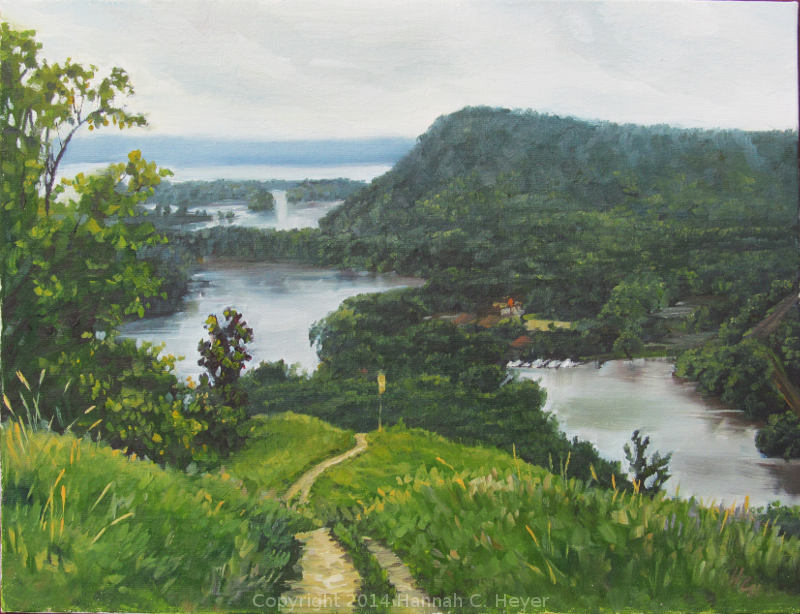 I ate lunch at the end of the trail, overlooking the river and bluffs, and then found a spot along the trail to set up my easel. 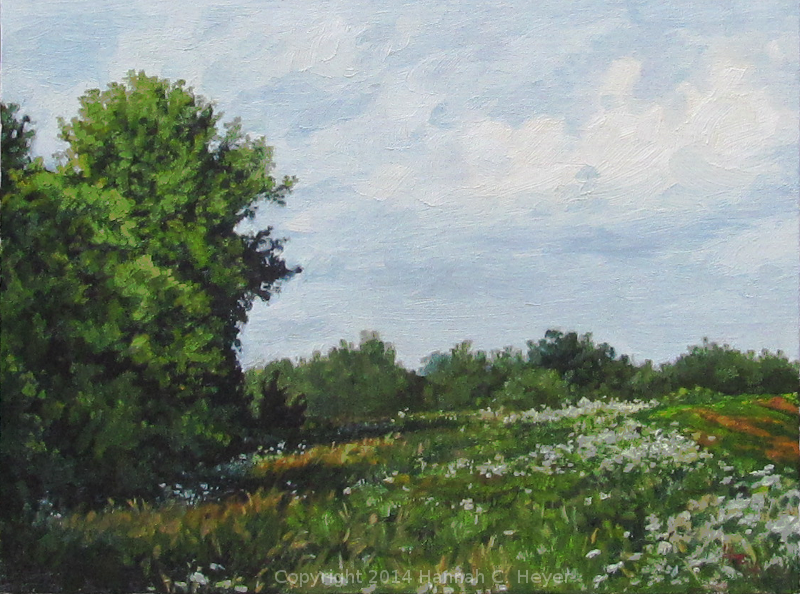 In the evening, as the sky cleared, I painted this tree on a farm off County road 1. 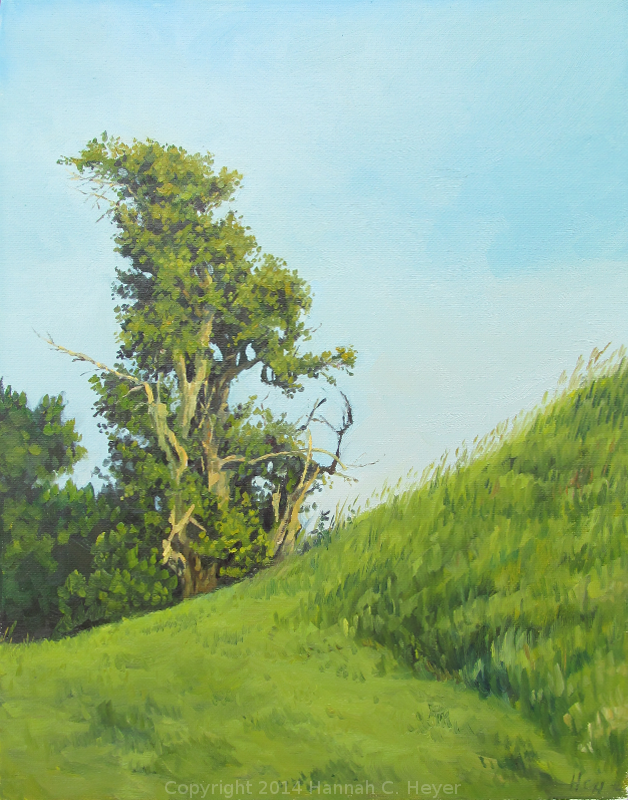 The same tree and hill, though it looks different and is from a different angle, that I painted the first year I did the festival. 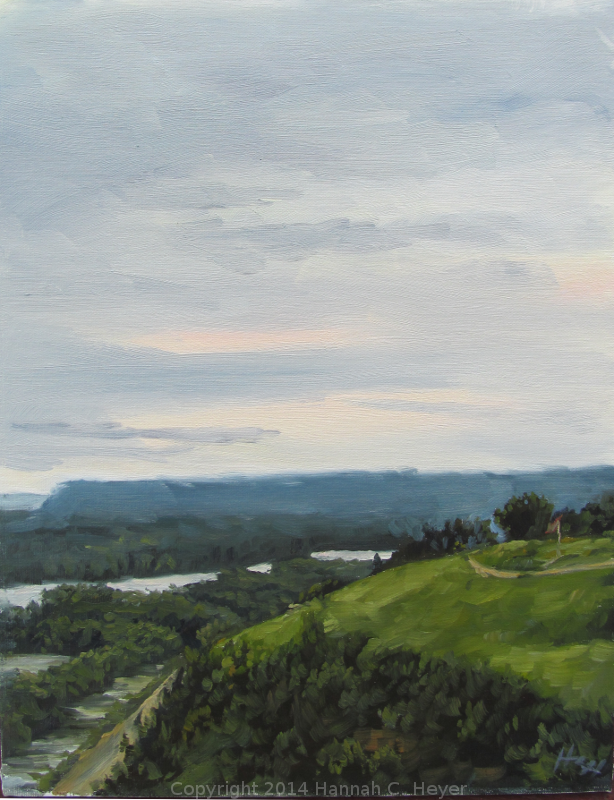 The next day was the day to paint the river valley. I had great ambitions, but had forgotten to have more of my panels stamped. :-p I did this one in Winona, standing on a dock in the shade. There was a cool breeze blowing in off the water, and few little families came and fished for bluegills and bass. In the evening I attempted a sunset paint. The sunset was very subdued, there were still a lot of clouds, and the mosquitoes were very, very, very hungry. 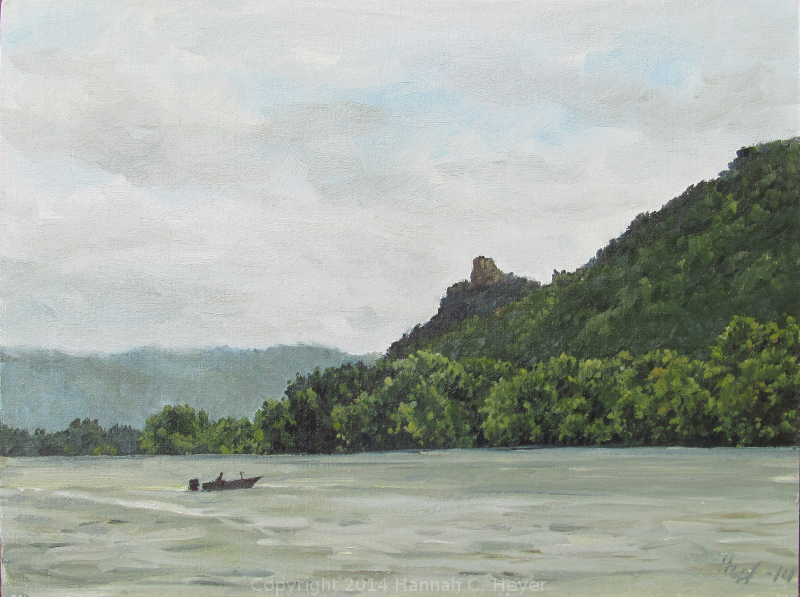 This is a view from Memorial Park overlooking the top of Barn Bluff. Friday was the day to frame and turn in three paintings to be hung and judged for the show. It rained off and on in the afternoon, but it was a lovely evening for the gala reception, with music from My Sweet Patootie. It's always fun to get the first glimpse of the show with everyone's paintings from the week. The show changes from Friday night to Saturday, with some paintings selling and new ones being hung. And it's nice to get a chance to talk with many of the artists who've been scattered about painting all week. 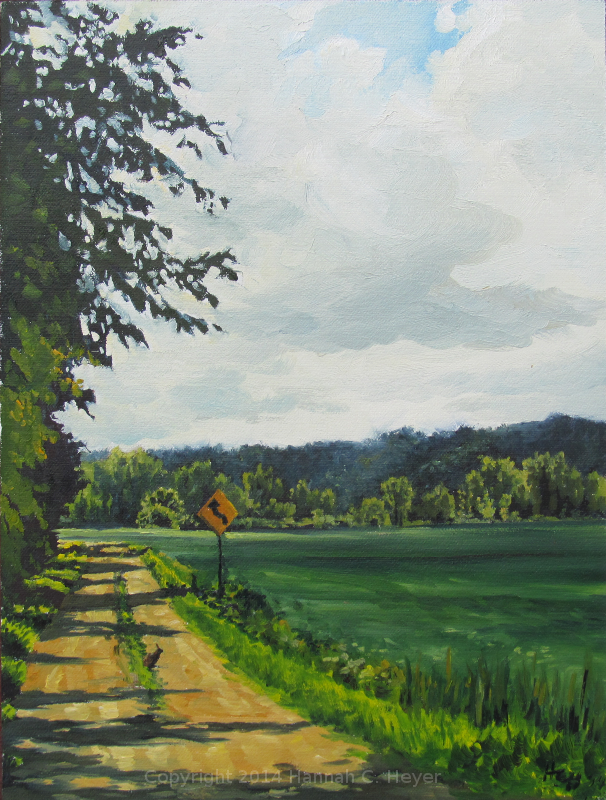 Awards were given, and I was very surprised and happy to receive an honorable mention for my painting "Rabbit Crossing"! Saturday morning was the quick-paint. We could paint from 9 to 11:00 sharp, and then had to frame and turn in the work by 11:30. The morning was mostly cloudy and windy. Rain was in the forecast, but thankfully didn't fall. With the river having overflowed its banks, some of the usual area was off limits! 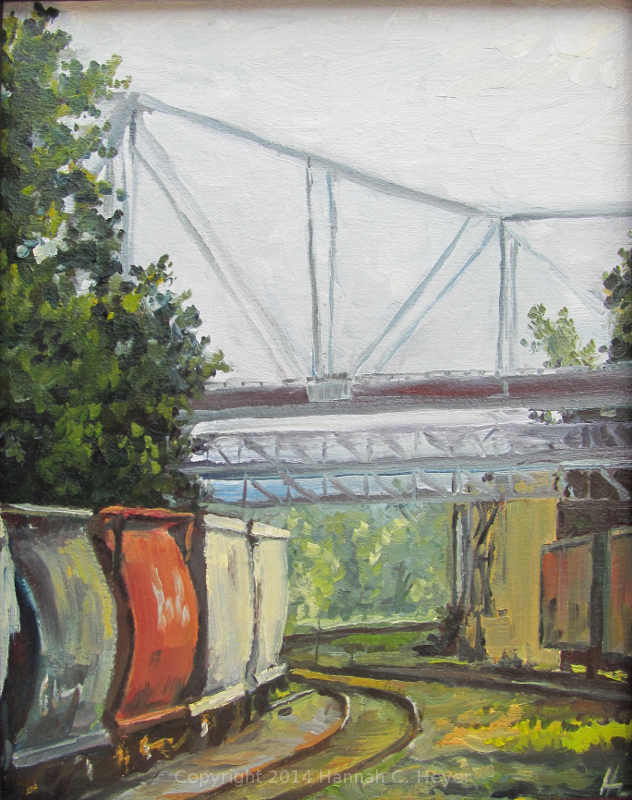 I picked this oft-painted scene of the train tracks and the bridge. I liked the soft, hazy view visible past the bridge, and the lines and colors between the tracks. So I had a pretty nice week in Red Wing. Sometimes the sun shone bright, and sometimes it was gray and rainy (like the morning I'd planned to paint the sunrise and the evening I tried to paint the sunset!) I found some new places to eat, and wasn't quite eaten alive by the gnats, ants and mosquitoes, and met and re-met some lovely people. I'm deeply grateful for everyone who made it possible for me to get away for the week and paint, and who bought paintings so I can keep doing what I love. May God bless you all.